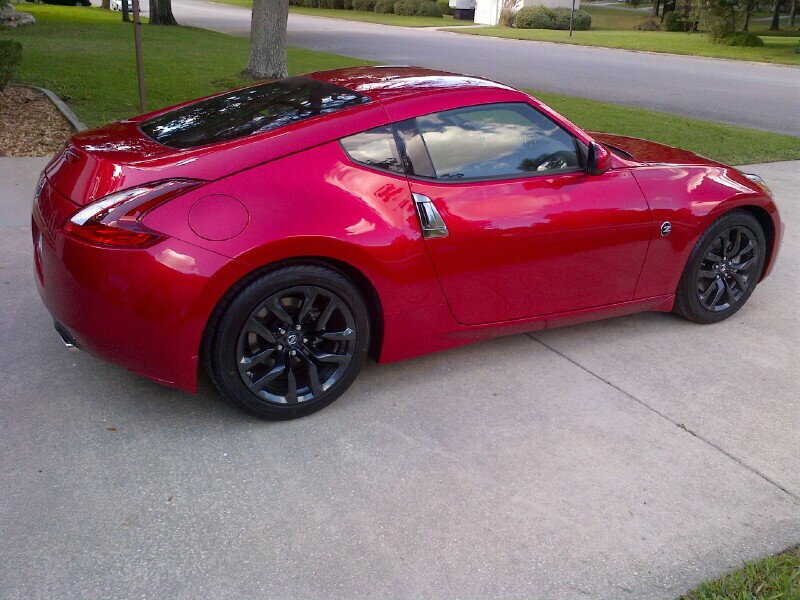 On Monday I cut a deal on a Passion red M6 Nissan 370Z. I got a "decent trade deal" on the GTO knowing I could have got a lot more if I sold it privately. My GTO had 106,000 miles on it but was in tip top condition and I enjoyed the car for the 2 years I owned it. Getting harder to find parts and I had already put a bunch of money into the car trying to make it as perfect as possible. I always liked the Datsun / Nissan Z cars and the 2019 370Z base is the right price for a lot of car. So far I love it but again the GTO is a unique car. Wish all you GTO guys and girls all the best and hope you can keep the GTO's going strong for years to come. Thanks for all your help and advise. congratulations any pics ? Idk if I could bring my self to sell a gto for a 370 even though they are nice cars . as much as I love mine, ive been debating going to something newer.......c7 has my attention currently. Thanks for responding guys. I have been a domestic muscle car and sports guy for EVER !!! Here are some of my past cars, 1967 GTO "1st car", 70 Hemi Cuda, 81 Vette, 92 Vette, 2002 Z06 heavily modded. Back in the 70's my 67 GTO was heavily modded and the car was one of the baddest around. Now in 2018 its really hard to be the baddest car around as you have ZL1 Camaros, Z06 & ZR 1 Vettes, Dodge challengers with 707 HP stock, Boss Mustangs etc. I decided to not try to compete to be the baddest and to find the car that is most satisfying in my price range. The 370Z is a lot of car for the money and can match a stock 2006 GTO in quarter mile time at about 13.6... The zero to 60 is a few tenths slower but that is okay. I will post some pics soon. Im still going to hang out on this forum as I am still interested in late model GTO's Keep the late model GTOs going. They are great cars and people are really starting to recognize that 12 years after they were introduced. I mean a stock ls2 GTO shouldn't be running a 13.6 in 1/4. the have low 13s and high 12s in them out of the box with a 6speed. Good luck with the z though they definitely are nice cars. Congrats on the new ride. I just purchased a 2006 cyclone grey gto and absolutely love it. Upgraded from an 01 ws6. The new cars are amazing but there is something about the gto that stole my heart. Parts do concern me. But that's the price you pay for something unique I suppose. Last edited by 01WS6BLACKLS1; 10-25-2018 at 03:57 PM. You planing on modding it at all ? I know they love turbos for sure seem to run good with just low boost . To all my GTO friends, here is a photo of the Z. A few of you asked if I will mod it soon. For now I am just going to enjoy it. Maybe a turbo in the future. Yes in the future performance exhaust, high flow cats, a tune and maybe a turbo in the future. I agree, the GTO is a great car. Like any car they have some inherent issues. They do get attention at car shows. Did not mean to insult. The 13.6 quarter mile times I quoted are from many sources. Motor trend, Motor week, Car & driver, and other specialty programs all did test runs on the 2004 - 2006 Gto's when they came out. Most all said 0 to 60 in 4.5 to 5.0 seconds. Quarter mile 13.4 to 13.6. That is no slouch for a 3.750 lb car. Also many posts on this forum verify those numbers. Just pointing out the Z is close to those numbers weighing in at well under 3,300 lbs helps a lot. Was trying to compare "bone stock to bone stock" You mention low 13's high 12's with a Du speed. That is not stock as it can add around 20 + H.P. You traded your gto for a 370z? Your man card has been revoked. Ok, bye. To Kfxguy - I don't get you !!! Why such a nasty comment. The comments are funny. I don't care what the magazines and testers say, the 05/06 will pull on a 370z in a straight line. 370z will walk away from a GTO on a road course and the twisties. Like the OP said they are a good bang for the buck car. I had a G37 for a while and loved the handling and the VQ engine is no slouch. They sound great with a mellow exhaust. Not a fan of the straight piped ones that seem to be in abundance near me. Nice color combo too, red on black looks good. No worries I didn't take it as an insult just stating that's not factual. An 04 will run high 13s for sure but the 05-06 have low 13s high 12s in them with a competent driver. Okay all is forgiven... You still have the GTO correct ? Slogoat, just so you know I was not trying to say the 370 Z is fasted then any late model GTO. Just saying it is close. Two totally different kinds of cars. By the way the dealer that took my GTO on trade sold it in 3 days for $12,500 with 106,000 miles on it. I have to admit I did everything to that car to make it right and it was in near mint condition. Was just time to move on..
C7 , beautiful car. Base car at Kirbeck Corvette in Atlantic City just under $50 K, Grand sports just under $60 K, Z06, well there crazy prices. Kirbeck offers anywhere from 7 to 10% off no nonsense deals in case your looking around. Bought my 2002 Z06 there in Sept 2001 at 5% off sticker.